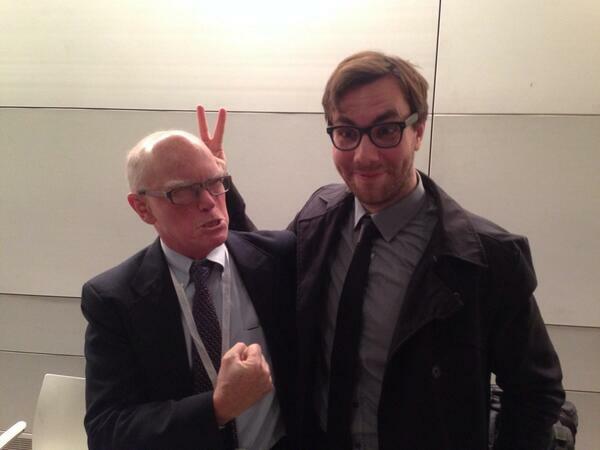 Stewart Baker, ex-NSA general counsel, and Jacob Appelbaum, internet freedom activist/hacker/journalist (left, right). They pretty much symbolise the two sides of the global scandal of the year. They also symbolise the attitudes of both sides. This struggle has defined a large part of my professional life in 2013. I was involved in defining much of this struggle (at least on the EU Parliament side) as a large part of my professional life in 2013. I was on a panel with both of them yesterday, which was one of the most unlikely things I ever imagined in my life. This picture was one of the more unlikely pictures in my life of which I imagined to be there when they were taken. But hey, I was involved in pulling that panel together. Most basic question that says it all: With whom of these guys would you prefer to hang out and collaborate and try to change the world? The answers to this one again can be on many layers, but they actually converge to the same answer. Update, 6 April 2014: Jake and Stewart now finally got into the heated discussion they were supposed to have back in December. The problem is that Rock beats Scissors. It's okay I think Jacob has a large collection of Papers to counter that.